The three month outage forced the hand of Africa’s largest telecom, halted operations of its leading e-commerce startup, and created digital refugees. The disruption also prompted a grassroots #BringBackOurInternet campaign that could serve as a global model for countering government internet meddling. Cameroon’s outage started on January 17 when net access went dead nationally, and then in the North-West and South-West regions of the country, according to Dyn Research, and Internet Without Borders. The affected areas―primarily English speaking―had been the center of protests over policies of the country’s 36 year incumbent president, Paul Biya, and linguistic disputes rooted in Cameroon’s colonial past. The country adopted English and French as official languages upon independence in 1961. Discontent over marginalization of English speakers in the Anglophone regions erupted into protests and strikes in January. According to Walla, the outage followed arrests of activists. “Everything was shut down across the entire country, then they put the internet back on in other parts of the country and left it off in the Northwest and Southwest,” she said. Cameroonians also reported a receiving a countrywide SMS from the Ministry of Posts and Communications warning citizens of imprisonment for spreading inaccurate information on social media. According to Enonchong, internet activity in the country is managed through the national telco, Camtel, which resells to all ISP’s and mobile providers―MTN and Vodaphone among them. A January 18 letter materialized from Camtel to the state telecommunications minister confirming suspension instructions had been delivered to the country’s internet operators. Cameroon has a burgeoning IT scene and the outage impacted it immediately. 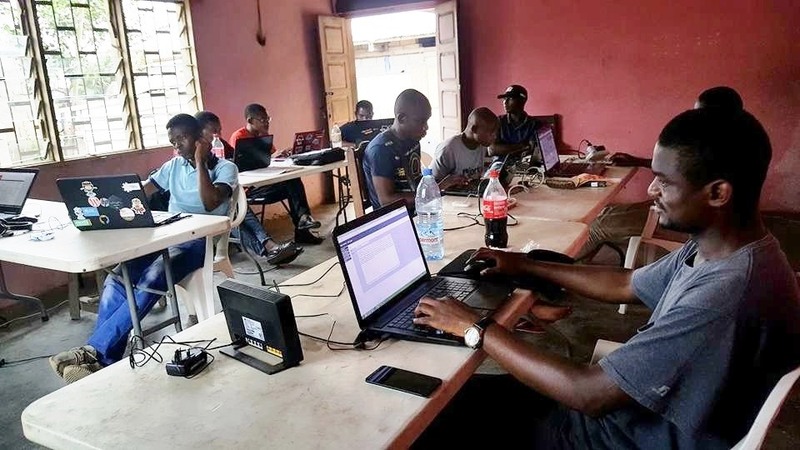 The center for the country’s startup ecosystem―dubbed Silicon Mountain―lies in Buea, the capital of the South-West region impacted in the internet blackout. Cameroonian Rebecca Enonchong is also one of Africa’s more recognized techies. The CEO and Chair of Cameroon’s Active Spaces innovation hub is a global speaker and advisor on multiple facets of the continent’s technology sector. Enonchong explained how Cameroon’s net outage forced digital dislocation and some unique measures to access email. Eventually, Enonchong and other tech leaders set up impromptu internet cafes. “At one point the travel had become so expensive that we rented small buildings right at the border between internet and no internet zones. We created internet refugee camps,” she said. Local techies also coordinated a local and global response to the internet blackout. “Internet activists reacted very quickly. Rebecca coined the hashtag #BringBackOurInternet. Somebody came up with the visual, a public letter was drafted and signed by many different people and organizations asking that internet be restored,” said Walla. “We set out to make as many people aware as possible of what was going on,” said Enonchong. The activists also “made sure the social media campaigns included the handles of Cameroon’s president, key political officials, and institutions,” said Walla. #BringBackOurInternet attracted the attention and support of a number of individuals and organizations, becoming a Twitter cause célèbre. Edward Snowden chimed in several times with Twitter support. Global organizations such as the UN and Access Now intervened. Though the Vatican would not verify, one source (speaking on background) said presidential aides confirmed the Pope raised the internet shutdown during his March meeting with Biya. The economic costs of Cameroon’s internet blackout also became apparent. In an email to TechCrunch, African e-commerce giant Jumia’s MD for Cameroon, Roland de Heere, said the internet outage led to an 18 percent decline in orders over the period. French telco Orange saw a 20 percent revenue drop in Cameroon. Access Now estimates the shutdown cost the country $4.5 million in economic activity. There was also the international reputational risk. The Cameroonian government has taken to touting achievements of the country’s tech entrepreneurs. “Ironically, senior officials were talking up Silicon Mountain at the same time the government had cut it off from the net,” said Enonchong. Cameroon’s Ministry of Telecoms announced several youth startup initiatives during the outage. Global press reported that the first African winner of Google’s annual coding competition, Cameroonian teen Nji Collins Gbah, lived in a blacked out town. As for lessons from Cameroon’s state forced internet blackout, “It’s a big mistake for governments in Africa or anywhere to underestimate the tech community,” said Enonchong. She also noted Cameroon’s digital debacle “politicized tech entrepreneurs who weren’t previously involved in politics” and sparked conversations between Cameroonian and global internet activists on best practices to overcome blackouts. This includes contingency plans―such as mesh networks―to bypass government network restrictions altogether, explained Enonchong. Kah Walla underscored the effectiveness of local initiative paired to global support. “The victory is in the fact that Cameroonians came together, used social media, and used our internal pressure to bring the external pressure,” she said.